Exhibit tells the stories of missing people, anguished families and the forensic investigations that reunite them. Sela Berisha told the story of her son with Down's Syndrome, who became separated from his family when they fled their home. (Nick Danziger)When war engulfed the western Balkans in 1991, little Sumida was just three years old and lived in a village just outside Sarajevo. As British photographer Nick Danziger and Canadian writer Rory MacLean show in the exhibit Missing Lives, now at the Canadian War Museum in Ottawa, her whole life was shaped by that war. Her village was burned in an attack, her mother was shot and killed, and her sister went missing. 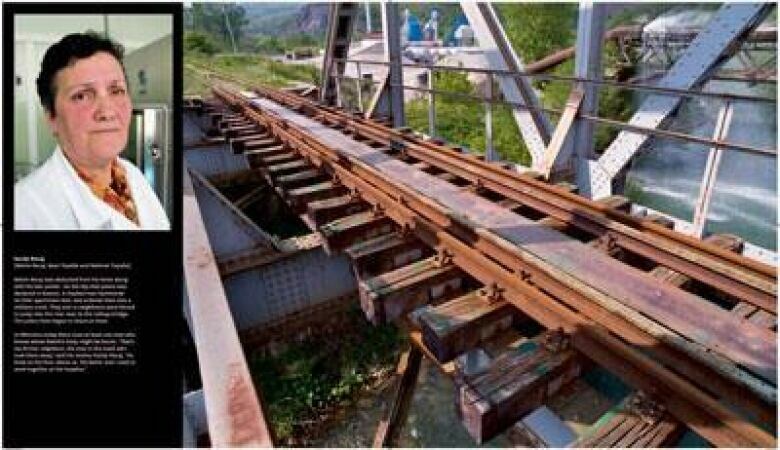 A soldier — one of those doing the killing — heard Sumida crying and plucked her out of harm's way. She was eventually adopted by an Orthodox family in Belgrade, renamed Mila, and raised and confirmed as a Christian. But as a teen, through DNA testing she learned that her original family was Muslim. She made contact with an aunt and moved to Sarajevo to live with her and now finds herself attached to two families from what were once warring camps. Danziger, a photographer whose work has been published regularly in Time, Newsweek and Paris Match, says Sumida/Mila is now 18 and painfully aware of her country's history of ethnic violence . "She said something that I found so moving. She said: 'It doesn't matter to me if you are a Serb or a Bosniak (Bosnian Muslim). What matters is that we respect each other. I was born into a Muslim household. In Belgrade I went to church and became Orthodox. Now I'm with my Muslim family again,'" Danziger said. "She, like so many others, was so desperate to get to the truth. She had actually, by herself, found and identified the man who killed her mother, [and] who saved her. He's in prison and she wants to see him to find out if he also saved her little sister." Sumida's story is one of 15 Danziger and MacLean tell with pictures and words in the exhibit . Sanije Recaj says she believes a neighbour knows what happened to her son, whose body has never been recovered. (Nick Danziger)Vancouver-born, Toronto-raised MacLean said they wanted to show the human cost of the war that divided the former Yugoslavia. That impact lasted well beyond the point where the world's attention had turned elsewhere, he said. About 30,000 people went missing in the Western Balkans, MacLean said, and almost 15,000 of them have yet to be found. "It was the families that wanted these stories to be told. 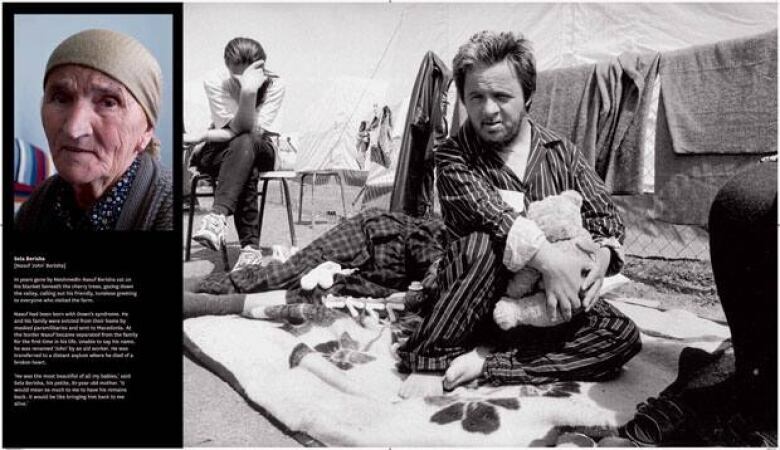 They wanted the truth of their suffering, their loss, out there and their stories to be put in the exhibition in the book in the hope that it won't happen again, said MacLean, author of eight books, including best-sellers Stalin's Nose and Under the Dragon. The western Balkans is now a centre for expertise in cutting edge forensics, the kind of DNA analysis and reconstruction of remains that North Americans might see in an episode of CSI or Bones, he said. Curiously, those doing the killing seemed to know their actions could be traced — when bodies were dumped in rivers early in the war, they could be identified by dental or medical records. So in later mass murders, the bodies were burned or chopped into pieces and put in separate mass graves, sometimes beneath existing graves so the disturbed earth could not be seen from the air. 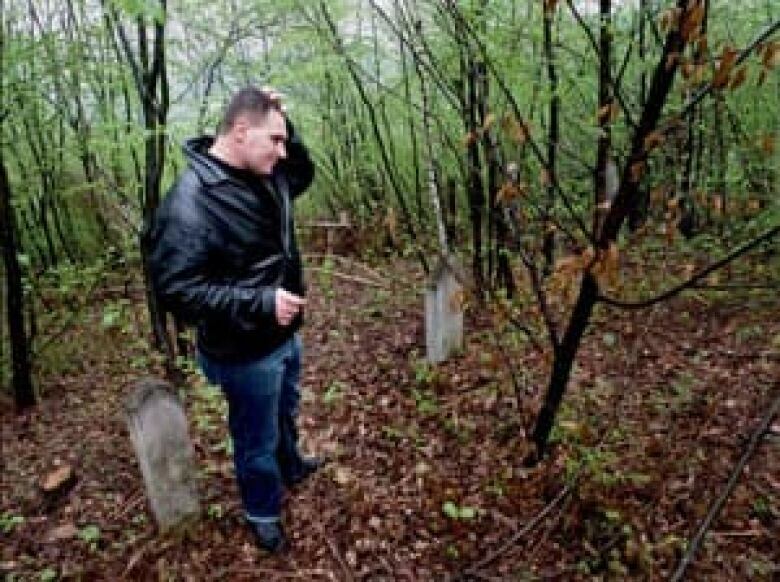 A man stands in a forest where people were buried beneath existing graves to hide the bodies from investigators. (Nick Danziger)Yet forensic science has advanced to the point where DNA can be extracted even from such abused remains, and compared to mothers and brothers and sisters left behind. Forensic scientists from Britain, Canada, Australia and throughout the EU are in the region using the latest techniques to identify the missing. Five of the panels in the exhibit relate to their work, which has helped match the missing with those left behind. One woman lost all the male members of her family — her husband, two sons, two brothers and four nephews — and lived 15 years without getting information about any of them. "Ten years ago, we met her and she was desperate," Danziger said, adding that she could not return to her home village as it had been razed. "She hadn't wanted to give a blood sample because she wanted to believe there was still hope and, by giving the blood sample, that would have made her feel that she accepted the fact that what she was looking for was someone who had died, who had been executed." In 2007, she finally gave a sample and forensic scientists were able to link her DNA to the partial remains of one son and a tibia of her husband. "Because the two sons were very close in age, they couldn't tell which of the sons it was," Danziger recalled. "She said to me at the time, 'How can I bury the son not knowing which son or just a tibia?' One of the images she allowed us to take was the remains of the bones in a bag that belonged to one of the sons in a cold storage unit where there are over 4,000 remains, all in body bags." Last year, another incomplete skeleton of the second son was unearthed and she then could bury two sons and her husband. Her remaining sisters and relatives, who had since emigrated to Australia, came for the funeral. The International Red Cross and the International Committee for Missing Persons are among the international organizations helping people in the region find the remains of people they loved. MacLean and Danziger worked with the Red Cross and ICMC to gather these stories from among the more than 80 families who were willing to talk about their losses. A book, Missing Lives, published last summer in London, tells the stories of each family in more detail. The exhibit has toured London, Brussels, 10 other EU capitals and the Balkans before coming to Ottawa, its only Canadian stop, before going on to Washington. Danziger and MacLean were in Ottawa Thursday for a panel discussion on the missing. MacLean said he and Danziger wanted to both "pay tribute to families of people who went missing and to mobilize national and international authorities to engage further with the authorities in the Western Balkans to release information." "Pressure is needed from international authorities to ensure that the various regional governments do come forth with with all the information they have, because there is a belief that information is still being withheld about secret graves…and tell the truth so these poor people can put to rest this terrible tragedy in their lives," he added. The exhibit runs until Sept. 5 at the Canadian War Museum in Ottawa.